Pancake Panic 5.9 for Windows and Windows Phone and Pancake Panic 3.7 for Android and Kindle Fire! 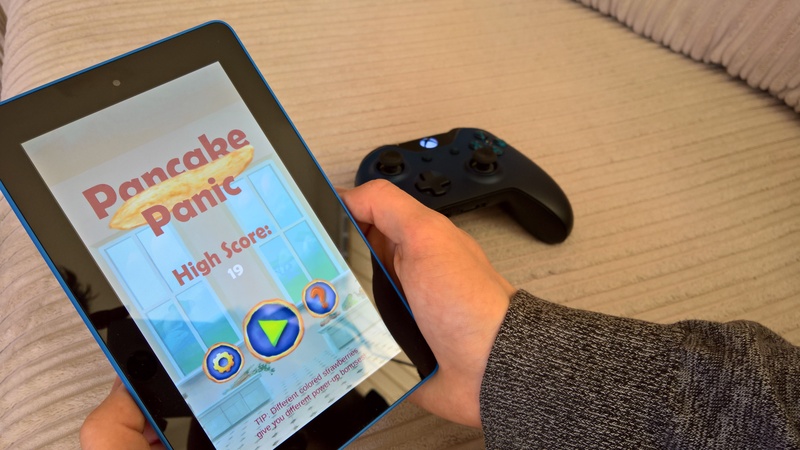 Windows, Windows Phone, Android, and Kindle Fire users of Pancake Panic will be getting updated versions of the game as it rolls out over the next few hours. First up in this update is some major changes to the in-game UI, improving the look of the game, especially on high-resolution devices. If you’re playing on an HD screen, you’ll notice that the UI now scales much better, and there’s a brand new bank button in place too for all players. Secondly, there’s a brand new silver strawberry which instantly banks any pancakes it touches on the way down! You can’t catch this one, so make sure you’re got the chef positioned in a good place to take advantage of this power-up! Super-sized pancakes (which are available after catching the blue strawberry) are now worth two points! Finally, we’ve also improved the Xbox controller support (for the Windows version) that allows you to play the game with any Xbox One or Xbox 360 controller plugged in including the wireless controller that comes with the new Xbox One S.
Pancake Panic is a game we made in a week to help teach pupils how to code. For the last year or so, we’ve been travelling all over the UK running workshops in primary and secondary schools. Pupils from these schools have contributed code to this game, and it’s been so much fun making a game this way. For more information about our coding workshops, click here. iOS players of Pancake Panic will receive this update in the coming weeks.